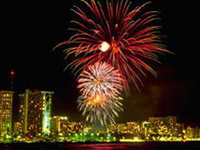 Welcome aboard our Waikiki Fireworks Cruise. Cruise with us along the picturesque Waikiki Beach on the ideal Hawaiian evening cruise. 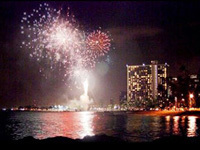 Every Friday night there is a spectacular fireworks show over the famous coastline of Waikiki Beach. Cruise under the stars and moon as fireworks cascade into the sea. This incredibly beautiful evening is a must do for anyone visiting Oahu. * You are welcome to bring along your own favorite beverages. 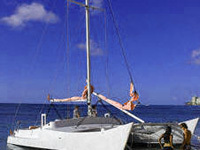 Our Catamaran departs at around sunset and cruises the famous shoreline of Waikiki as the sun sets over beautiful Oahu. 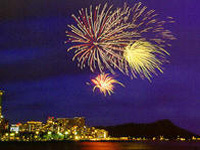 Relax on board and take in a beautiful fireworks display as they explode and cascade into the sea. 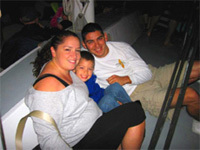 The captain and crew are committed to providing you with a fun, safe and comfortable experience. Our super friendly Crew ensure an incredibly memorable experience. Non-alcohol beverage of sodas, juice and waters are available for purchase throughout your cruise. You are welcome to bring food and wine, beer, champagne or your other favorite beverage onboard. Our catamaran has limited capacity, so please book early to insure your seats on this beautiful evening tour. You are welcome to bring along your own favorite beverages.